"And the Holy Spirit descended on him in bodily form, like a dove; and a voice came from heaven, 'You are my beloved Son; with you I am well pleased'" (Luke 3:22). The Christian faith is given a beautiful tribute in this gleaming pendant from Apples of Gold. Forged of 14K white gold, the pendant is crafted into the shape of a Christian cross, with clean, simple lines giving the pendant contemporary style. The center of the cross reveals a single dove that continues the theme of Christian faith in this piece. This exquisite pendant is polished throughout to complete the lovely style and shape of the piece. Cross measures 32mm long x 19mm wide not including bale. Including bale the cross is 39mm long. Cross thickness is 1.2mm and dove measures 8mm x 8mm. 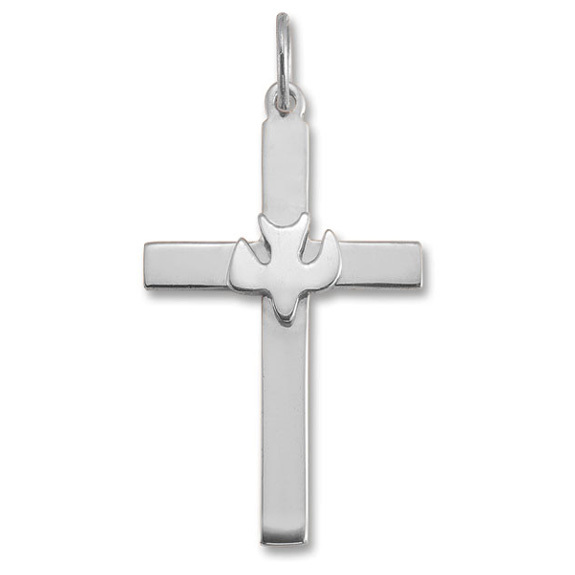 We guarantee our Christian Dove Cross Pendant in 14K White Gold to be high quality, authentic jewelry, as described above.